Let me start by saying this is not an article from a marriage expert. No, I am the furthest thing from it. In fact, I have been divorced twice. If you're hoping to gather some professional psychological findings I suggest you check out Dr. Phil's blog. In this article, I am not going to pretend that I know anything about being in a military family. Because I DON'T! I truly believe it takes a very special type of individual to make a commitment to a person who will spend half of their life away deployed, or even away at schools and training. It also takes a very strong person to raise children in a happy home without day to day help. I can HONESTLY say that I really don't think I ever would have lasted in a long-term relationship or marriage with a service member. To all of you who make those sacrifices every day, you are amazing! God bless you and your family. I have known my partner Nick, for about 4 years. Nick is a Special Operations Marine Corps veteran. He had been out of the military just briefly and was truly just starting his transition. We had sort of a rocky, messy start. But I can honestly say we are constantly evolving and learning more about ourselves and one another everyday. By no means do I pretend to understand the depths of pain and sadness that combat veterans face. I can only imagine that it would be like living out your worst nightmares and never being able to wake up. An entire generation of our country's men were growing up in combat all the while, most of us were enjoying college, having bbqs, and complaining about the temperature of our lattes. They were fighting wars and watching their friend's die. That’s something that most of us didn't experience. That’s something that most aren't ready to talk about. For those who came home in one piece, we we are faced with the invisible wounds of war. Post-traumatic stress is real. Traumatic brain injuries are real. Insomnia, low testosterone, depression, hyper-vigiliance, all of those things are real. One thing that most partners of veterans won't talk about, is that fact that their significant other can't sleep in the bed with them. We are talking about people who have spent over a decade sleeping alone on a cot. Nick sleeps like he's in a freakin coffin, he likes hard surfaces, his woobie, and he doesn't like to be touched. Lol. 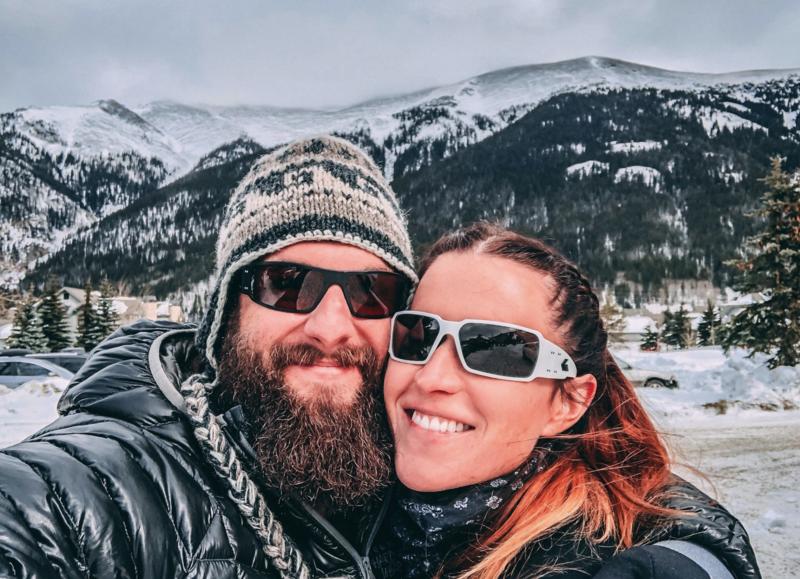 So as a partner of a combat veteran, how do you help your partner while also addressing the needs and desires you have as a human being? This is for BOTH of you. If you're in a relationship with someone who has been in a high-stress envoirment for over a decade, it is time for them to receive the care they need. I am talking about sleep, healthy eating, working out regularly, and dealing with low testosterone. You can NOT MAKE your partner get the help they need, but you can facilitate it. My life is a constant cycle of scheduling, meal-prep, and holistic therapies. Our household is set up for success and it took us a while to get there. Cleaning out the pantry of junk, making the gym a priority and forcing ourselves to go to bed early has become our new norm. *IF YOUR PARTNER IS STRUGGLING WITH ALCOHOL OR DRUG ABUSE, IT IS IMPORTANT THAT YOU KEEP IT OUT OF YOUR HOME. The biggest support you can offer someone in recovery is lifestyle change. If you want to be in a healthy relationship with someone, you both have to be healthy and whole yourselves. If you are extremely sensitive, being with a combat veteran is probably not a good idea for you. When you're with a dude that spent the last decade hanging with other dudes, there's a very good chance - he's gonna treat you like a dude. It's always good to express your feelings, wants, desires and needs, but it's important to know that the way your partner operates and communicates is not as much a reflection of the way he feels about you, but more maybe a reflection of the way he feels about himself. Practice letting things go. I am not encouraging you to enable emotional abuse. But I am reminding you to be understanding. Speak with a counselor if you are looking for a third party to listen and hear you out. Don’t make it painful for people to tell you what you don’t know or what you may not want to hear. Don’t freak-out or overreact; it’s condescending and causes people to stop communicating. Nick has best described his time in the military as a moving train. Constantly going forward full speed in a clear direction. You can collect baggage and passengers a long the way but the train keeps moving. He said that getting out of the military is like pulling the lever on a train suddenly. No one is prepared for it, no one is braced for it, a fast moving train full speed ahead coming to a screeching hault in an instant; a complete life change. Transition for anyone is a challenging time: graduating college, getting married, having your first child, getting divorced, a career change... are some of the biggest life changes and are the most stressful. The military isn't just a job; it's an institution, a way of life, a community, who you are. Changing who you are in the middle of your life is an identity shift. Most people aren't prepared for it. Sometimes having it all figured out is exactly the problem. If you're with a veteran during his or her transition, BE FLEXIBLE. Spend as much time as you can outdoors, enjoying adventures and seeking enjoyment in new places. I read a quote not too long ago that resonated with me. If you are depressed, you are living in the past. If you are anxious you are living in the future, if you are at peace you are living in the present. Everyday truly is a gift. The healthiest way to live is in the present. You will never replace the relationships your partner shared with his brothers in combat. We may never understand the significance of the ones that he lost. The pressures of future can be overwhelming, even daunting to someone who has experienced so much death. It is so imporant that we grasp how to live everyday to the fullest. To live in the present, truly in the present, is the only way to truly find peace with who you are today. Taking time each day to meditate on the things for which you are most grateful, encouraging your partner to do the same will help attain the most healthiest relationship possible. If you or a loved one are facing challenges or struggling please reach out. It is our goal to see veterans successful in every aspect of their life. Relationships are the most important part of our lives. If counseling or rehabilitation, we can get you the resources you need. Please connect here.